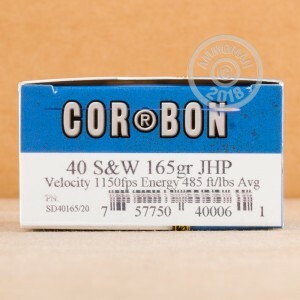 Corbon's take on the .40 S&W gives this already powerful cartridge an upgrade--and gives you a potent choice for self-defense. These rounds fire a 165 grain jacketed hollow point bullet at a high muzzle velocity of 1,150 feet per second. This high velocity comes with a significant increase in recoil, but more reliable expansion. This combines with 9-15 inches of penetration to produce better terminal performance in skilled hands. Each box contains 20 cartridges. 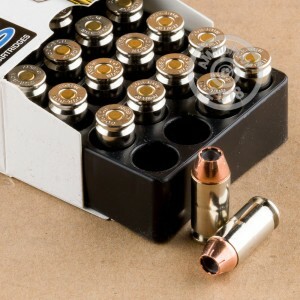 This ammunition is loaded in Sturgis, South Dakota and uses non-corrosive Boxer primers. As part of the Self-Defense series, it is designed to be effective yet affordable. Grab a few of these boxes or any combination of items totaling $99 or more from AmmoMan.com to get free shipping!